To order a printed copy of the Lands End Clothing catalogue, simply click the Request button below. Fashion that fits the whole family! At Lands’ End we are committed to making stylish, hardworking fashion for the whole family, and we’ve been doing just that for over 50 years. We design beautifully-crafted clothing, iconic, updated classics and chic, modern styles. Including practical outdoor clothing, comfortable casual clothing and up-to-the-minute styles – the perfect selection of fashion online for women, men and kids – and everything Quality. Guaranteed. Our high quality, fashionable clothing is designed for all the family. Our menswear range has you covered, whether you’re going sailing, suiting-up, working out or winding down. Our comprehensive range of casual and tailored styles include Lands’ End men’s coats and men’s jackets to create the perfect wardrobe for today's lifestyle. Our womenswear ranges include beautifully made classics, key wardrobe staples, iconic styles plus the latest trends. With chic accents and stylish cuts, our range encapsulates the latest women’s fashion with timeless pieces in a wide range of fits to flatter every body shape. Complete your outfit with our beautiful Lands’ End ladies boots and shoes, scarves and jewellery. Our children’s clothing is designed with real kids in mind. We know they'll put their clothes through the toughest tests so we ensure that durability is at the heart of every piece in our kids clothing range. From waterproofs to snow boots, dresses to denim, graphic tees to trousers – all really well-made in bright, fun colours and fabrics. Whatever your style, at Lands’ End we make online shopping easy. 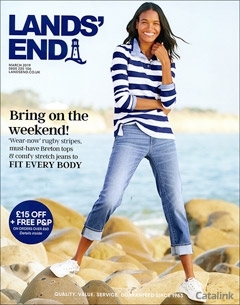 Lands End Clothing Catalogue Karen T. said: Good value for money and good quality. Lands End Clothing Catalogue Marie W. said: lovely different styles of fashion. Lands End Clothing Catalogue Becky G. said: A very pleasant catalogue to look at, wide range and good quality. Lands End Clothing Catalogue Clair R. said: Best coats I have ever owned, wonderful quality. By pressing the Request Printed Catalogue button you give consent to Lands End Clothing (and their Data Processors for the specific purpose of delivering your literature) to send you their Catalogue.